Available in many apps from Apple is the use of the built in dictionary. If your reading a book, your able to look up the meaning of a word with a simple tap. You are also able to expand on the word by viewing words with similar meanings. To go beyond that, you need the app Blends. We were first introduced to Blends months ago and have been toying with it since. The app carries with it over 147,000 words, uniquely ID’d through the Princeton University WordNet Project. The words are kept within the Blends app so there is no Internet connection required to use. Simply enter a word and you will receive a list of ‘matching’ words in a list. Tapping any will expand the information to include words with a ‘relationship’ to that word, further expanded with examples, synonyms, antonyms, hypernyms, hyponyms and more. All of these are linked to other ‘blend’ words. 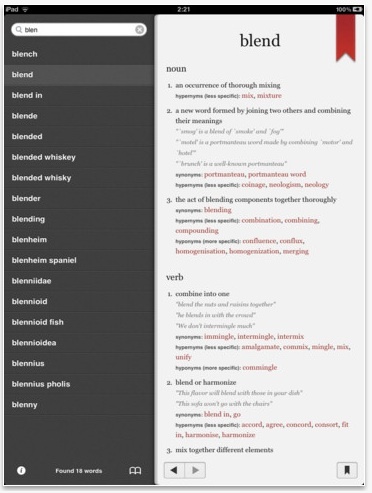 Basically, when you search for a word, Blends gives you more than just the meaning, rather a expanded view of relationships of that word to other words and short descriptions. This can be both fun to dig through and also very enlightening when your trying to get a point across in a document but need more than just a word look up to find the best path. A couple bonuses of Blends, this is a universal app so you can buy once and use it on your iPad and iPhone, you can use ‘?’ and ‘*’, as well you can bookmark your searches for quick return later. We have nothing really special to say about the Blends other than it just works… it does what it is supposed to. Allowing our iPad to offer a bit of safety for us when working on an article and we hit a roadblock.